I don't usually do small jobs, but when I got an email from my old acting teacher I didn't think twice. If you're lucky, you have one or two teachers in your life who truly make a difference. I've had two and Richard was one of them. Richard has a terrace but no irrigation and no desire to install a watering system. He didn't want a full blown garden, just a few boxes to block the view from across the street into his bedroom window. (Can you blame him?) I won't usually do a job without irrigation, but I'd do anything for Richard and I told him so. 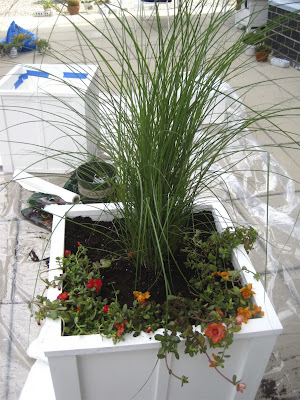 He wanted ornamental grasses, which sounded perfect for his full sun location. Once established, they'd be pretty drought tolerant, but getting them through the first season was the challenge. 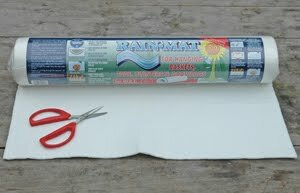 Friend and colleague Sara suggested using the rain-mat from Kinsman as a liner. The woven fiber mat contains water retaining polymers which absorb and retain moisture, releasing it to roots slowly, over time. These are potassium-based, rain-gel granules, not sodium based polymers. (There is some concern that sodium based polymers may result in root burn.) The bulk roll is 16 feet long and 22 inches wide, which was almost exactly how much I needed to line two, 22-inch cubes. 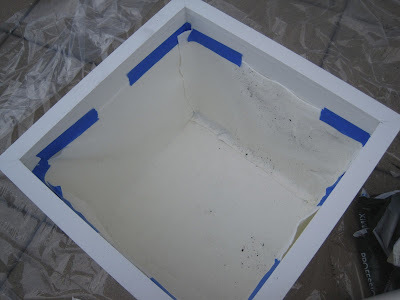 I cut the mat to fit the sides and bottom of the containers, then taped them in place with painter's tape. The tape doesn't have to hold for long, just long enough for me to plant the container. Once the potting mix is added, it holds the mat in place. I also cut holes in the bottom layer to match up with the drainage holes in the container. We chose Miscanthus sinensis 'Morning Light' and I underplanted each grass with portulaca, another drought tolerant, sun & heat loving container plant. For the record, I paid full price for this product. It's easier to give something a bad review if you don't feel beholden. I needn't have worried. I planted the grasses at the beginning of July, then promptly left town for two weeks, during which time NYC experienced a brutal heat wave. When I got back, I called Richard to see how everything had come through, and he had good news: no drought stress on the grasses and he'd had to cut back the portulaca, it had grown so well. The moral of this story is that if you just want a few containers and can't install an irrigation system in your outdoor space, you aren't limited to cacti and succulents. With drought tolerant plants, and a little extra life support, good things are possible.